If you’ve not had a chance to visit your local farmers’ market recently, brave the crispness in the air and get out there. Fall is a fabulous time for fresh fruit and vegetables wherever you are. Here’s some of the wonderful produce I picked up today at Atwater Farmers’ Market in East Los Angeles, Southern California. As you can see, Los Angeles is a delicious place to be right now, with the last of the summer’s fruits still available, as well as the new crop of autumn’s bounty. Peaches rub shoulders with persimmons, tomatoes mingle with pomegranates, and lettuces happily nestle amongst the pumpkins. But even in the coldest parts of America and Europe, it’s an exciting time for farmers’ markets. Hardy leafy greens like kale, chard and cabbage grace stands with their deep jewel colors and clean, intense flavors. Squashes of all kinds are everywhere, including little flying saucer shaped patty pans and larger pale yellow spaghetti squash, like the one pictured here. The simplest way to prepare spaghetti squash is to prick it with a fork, place on a baking sheet and bake whole at 375 F (200 C) for about an hour, depending on the size. Once it’s cooked, leave to cool slightly, then cut it from top to bottom. Scoop out the seeds, then separate the strands using a fork. Serve with your favourite spaghetti sauce, or simply drizzle with a little flavourful oil and serve as a side. 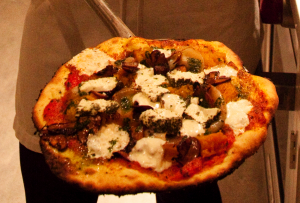 Could this be the most delicious pizza in the world? Here’s private chef Kat Turner proudly showing a pizza while I gaze on lovingly, tempted by its sweet aromas, excited to taste a bite. Her pizza’s fresh out of the wood-burning oven here in Chicago, Illinois, home of the traditional deep-crust pizza, but currently nurturing a new breed of pizza pioneers. Kat specializes in cooking food with an eye to special dietary needs, such as no dairy, no wheat or no nightshades. Her hand-kneaded pizza dough is sometimes made with traditional wheat, and other times made with a gluten-free flour blend, then topped with a robust combination of allergy-friendly ingredients. First, she smeared it with her own ‘nomato’ sauce. It’s a special blend of beets, carrots, onions, celery, thyme, bay leaf, and a tiny bit of chicken stock to make it more robust. No tomato needed. Sometimes she makes it stronger flavored still by adding garlic and Italian herbs such as fresh parsley and oregano, but tonight it’s acting purely as a base for the other toppings. First up, there’s a killer sage oil, made by heating minced garlic and fresh sage in a skillet, then adding oil and gently continuing to infuse the oil with flavor. After a while, Kat strains the sage and garlic, pressing them to release as much of the liquid as possible, then adds a little lemon juice and minced spinach to make a rich deep green color. A little goes a long way, so she painted the pizza with just a dab or two. Next, we added some of the butternut squash and onion that I roasted and blogged about here. On top of that, Kat added a some nuggets of mozzarella and herb-rolled goat’s cheese, plus a few plump balsamic-glazed sliced mushrooms. Then it went straight into the superhot oven… And you know what? I really do think it was the most delicious pizza in the world at that moment. 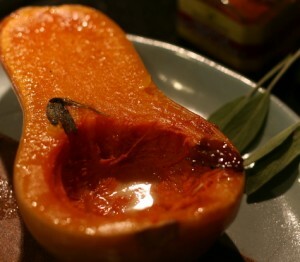 As autumn draws in, opportunities arise for slow roasting squash. As we speak, the air around me is filled with the aroma of sweet caramelizing squash juices meeting nutmeg, cinnamon, pepper, sage and thyme in their roasting pan. Doused in a light grapeseed oil with a splash of water, the whole deal took about ten minutes to prepare, but at 325 degrees, the cooking flavors will scent the air for the next 3 hours. Come supper time, I’ll be ready to blend the squash with caramelized onions and garlic and serve it with plain boiled organic short grain rice, macrobiotic-style. Would you like to join me?